Coffee, like most food, has an optimal window of consumption. Many gadgets and techniques have been created to keep it fresh, but time is a fierce foe. So when I get coffee from a roaster, I look for signs of age. I look for roast dates (uber handy), I look for CO2 valves, I look for good packaging and a good smell off the beans. But sometimes, even when all of the above don't happen, the coffee can still turn out well. When I got a package from Roaste, it had an Ethiopian Harrar from Flat Black Coffee Company in a simple paper bag and not much of a dry aroma. Usually this tells me this coffee is going to be rough, but compelled to not judge a coffee too harshly before I tasted it, I pressed on. And press I did. I french pressed my first batch and was delighted to have a small explosion of berry off the start, followed with deep chocolate notes and a light, tea-like body. The vacuum press had a little less luster, with similar berry effects and a hints of pineapple and an oolong-ish taste on the back. The drip was very similar to the first two, but even more subdued. In my final deductions, it seems this coffee was a little older than optimal but nonetheless a great coffee despite it. I'd be curious to try this coffee three days fresh out of the Flat Black roaster to compare. 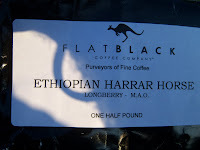 If ye happen to order with Roaste or straight from Flat Black, give the Ethiopian Harrar a try. Harar is one of my favourite beans to roast and cup. Always very complex, and even the variations from year to year are a treat! Interesting blog, I should try Harar and I wonder if I like it. It was very interesting for me to read this blog. Thanx for it. I like such themes and anything connected to this matter. I definitely want to read more on that blog soon. Great article you got here. It would be great to read a bit more about this topic. Thanks for sharing this data. Hi, it's spam bot, please, delete this message and i never return) I promise.